Wrexham's Louis Moult has scored four goals in his last five appearances for Wrexham. 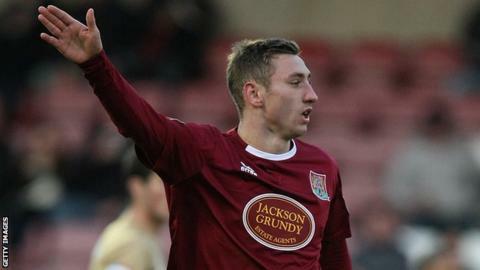 Wrexham top scorer Louis Moult struck a superb free-kick to inflict a first defeat of the season on Forest Green. Moult found the top left corner with his 54th-minute strike - his fourth goal in five games - following Rob Sinclair's foul on Connor Jennings. It was the highlight of a scrappy game that saw Rovers substitute Lee Hughes sent off for an 83rd-minute foul on Wrexham keeper Daniel Bachmann. Bachmann had denied Rovers with superb saves from Jon Parkin and Marcus Kelly. The Welsh club's third consecutive away win lifts them to seventh in the table, five points off top spot, while Rovers slip to 11th - a point behind. "Wrexham are the best team we've played. They'll do really well. They'll win the league this year. "It was pathetic after they scored. We lost everything. We lost our discipline which has been good all season. "I'm fuming. Some players just weren't good enough, they just hid." "I'm delighted after the previous two results. To come away and keep a clean sheet and score a fantastic goal and play in the manner and fashion we did was especially pleasing. I do feel we were thoroughly worth the three points. "Louis Moult has done that a couple of times for me last year, but you know he's got that in the locker and to come up with it when there were not a great deal of chances was great." Match ends, Forest Green Rovers 0, Wrexham 1. Second Half ends, Forest Green Rovers 0, Wrexham 1. Attempt blocked. James Norwood (Forest Green Rovers) right footed shot from the right side of the box is blocked. Attempt saved. Jon Parkin (Forest Green Rovers) header from the centre of the box is saved. Assisted by Kurtis Guthrie with a cross. Lee Hughes (Forest Green Rovers) is shown the red card for fighting. Daniel Bachmann (Wrexham) wins a free kick. Attempt missed. James Norwood (Forest Green Rovers) header from the centre of the box misses to the left. Assisted by Sam Wedgbury with a cross. Attempt saved. Manny Smith (Wrexham) header from the centre of the box is saved. Assisted by Mark Carrington. Attempt blocked. Louis Moult (Wrexham) right footed shot from the centre of the box is blocked. Attempt saved. Johnny Hunt (Wrexham) left footed shot from outside the box is saved. Attempt missed. Daniel Coles (Forest Green Rovers) header from the centre of the box misses to the right. Assisted by Rob Sinclair. Attempt missed. Louis Moult (Wrexham) right footed shot from outside the box is too high.